First, you need to know that “lilikoi” is our Hawai`ian word for passionfruit, the fruit of the Passion Flower vine. Read the Wikipedia religious explanation of the word “passion.” But I’m passionate about the passionfruit (groan), which I know mostly as lilikoi. A friend in Na`alehu gave me a huge box of lilikoi fresh from the vine. I love to simply scoop out the insides with a spoon and eat, seeds and all. But this time, there were way too many to simply sit and eat myself sick. So I asked around for some recipes. My masseuse (Velvet) gave me this recipe. The process I use for juicing is to cut them in half, scoop out the insides, and let that drain in a colander for about 24 hours to get rid of the seeds. My house smelled like lilikoi for days after I finished juicing them. Mix juice, sugar, butter in a large pan. Heat until butter is melted. Beat the eggs together in a separate bowl and temper by drizzling a little of the hot liquid into the beaten eggs so they don’t scramble on you. Keep stirring and when the egg mixture is about the same temperature as the hot liquid, pour it into the pan with the juice, butter and sugar. Bring to a rolling boil, then down to a slow rolling simmer for about half an hour. This will thicken as it cooks. I don’t know how to improve on this simple recipe other than to use it whenever you can, over whatever you can find. I like it over ice cream, on toasted English muffins or scones, over plain cheesecake, or just right out of the jar with a spoon! I made a double batch with all the lilikoi I had, and ended up with twelve jars. They look like jewels on my shelf! I first published this in September 2009 and have had many requests for it since. 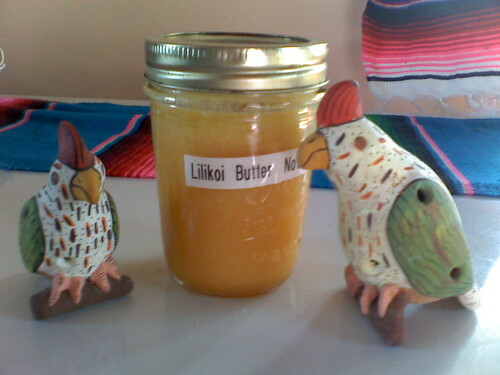 If you are interested in seeing later posts I did on Lilikoi Butter, look for them under “Categories” on the left-hand side of this post. When I was pastoring at a church in Arizona, someone always brought several dozen doughnuts from the local bakery to serve with coffee during a fellowship hour. If some were left over, I took them home and let them get stale for a couple days. Then I would break them up into bits of about an inch to make this bread pudding – regular doughnuts, cake doughnuts, jelly-filled doughnuts, cinnamon twists, and the like. What a delicious and unusual bread pudding! 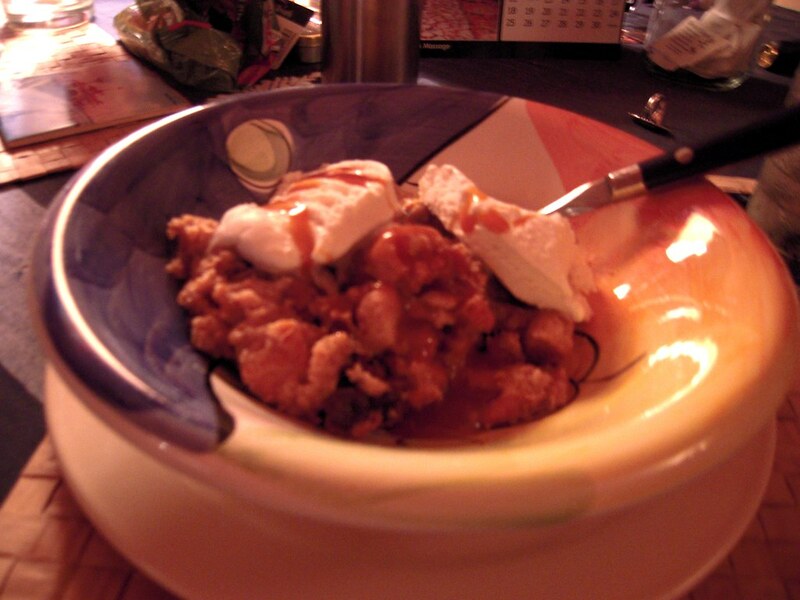 So I recently got hungry for some old-fashioned bread pudding and dug out my old recipe. 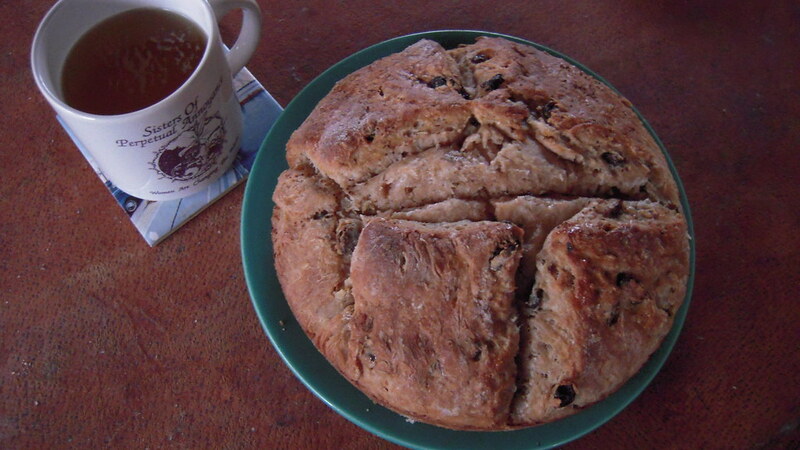 This time I used whole wheat bread and dark raisins. The photo above is fresh out of the oven. In the next photo, it is topped with vanilla bean ice cream and dribbled with caramel syrup. Too delicious for words! 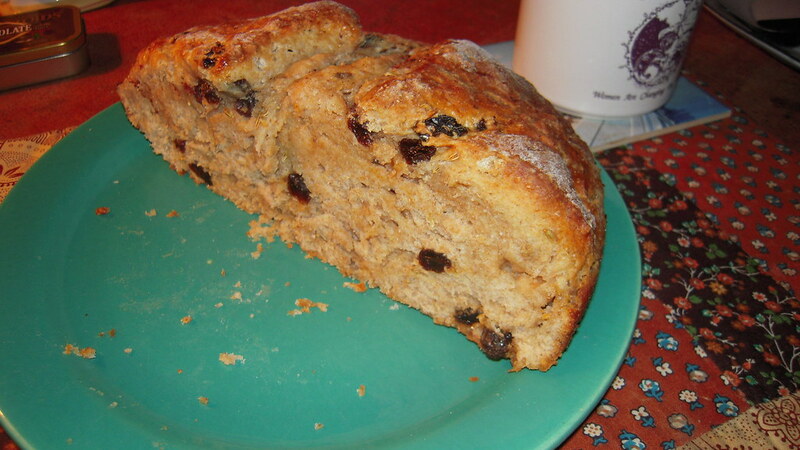 Combine bread and raisins (or other dried fruit) in a buttered 1 ½ quart casserole. Add milk to eggs, sugar, salt, cinnamon, nutmeg and vanilla. Beat with a whisk until well mixed. Pour over bread and dried fruit. Bake at 350 F for about an hour. You can add almost anything fruity or nutty to this, like flaked coconut or chopped macadamia nuts. I like it warm with ice cream or cold applesauce. 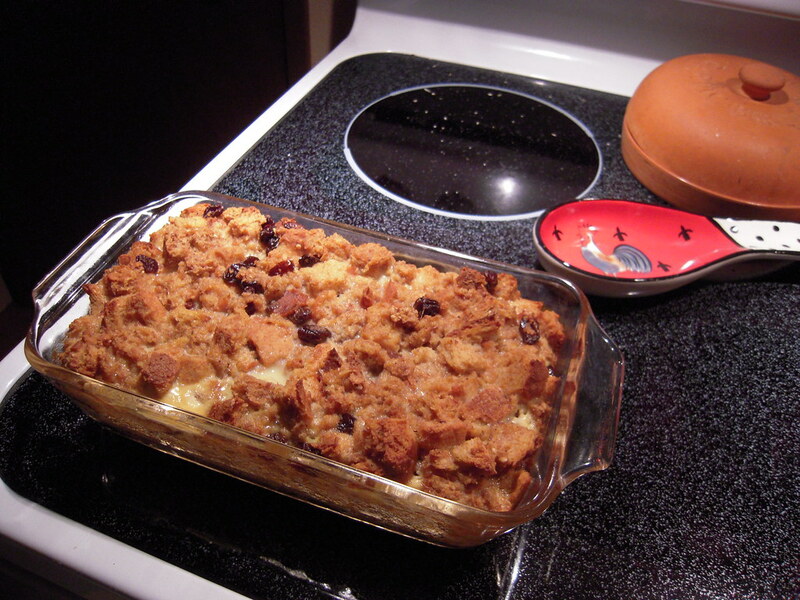 Bread pudding is a popular dish here in Hawaii. I guess it’s a comfort food for a lot of people! I have been using various recipes for Irish Soda Bread for many years. Over a decade ago, my daughter in Idaho sent me a recipe that came from the Irish grandmother of one of her former co-workers. It surpasses anything that I’d ever made before and I pass it along to you in preparation for St. Patrick’s Day next week. Measure and combine dry ingredients. Cut in butter with a pastry blender (or in a food processor). Stir in desired amount of raisins and caraway/fennel. Stir in buttermilk. Turn dough onto floured board and knead a few minutes, adding flour until dough is not too sticky. Form into a ball and place in greased and floured round baking pan. Cut a deep cross on top. Bake at 375 for 45 minutes, brush top with simple syrup made of sugar, water, nutmeg and continue baking a few more minutes. Let cool 15-20 minutes before removing from pan. Add a big pot of corned beef, cabbage, carrots, onions, and peppercorns so you’ll think you are back in old Ireland. As a preacher’s kid (we were called PKs), I grew up eating quite a variety of foods made by church members. Several years before my father died, he and my mother decided to put together some of the recipes they’d gathered over the years. He typed them up on an old Underwood typewriter and Mother (Jane) made some rough sketches to go with it. 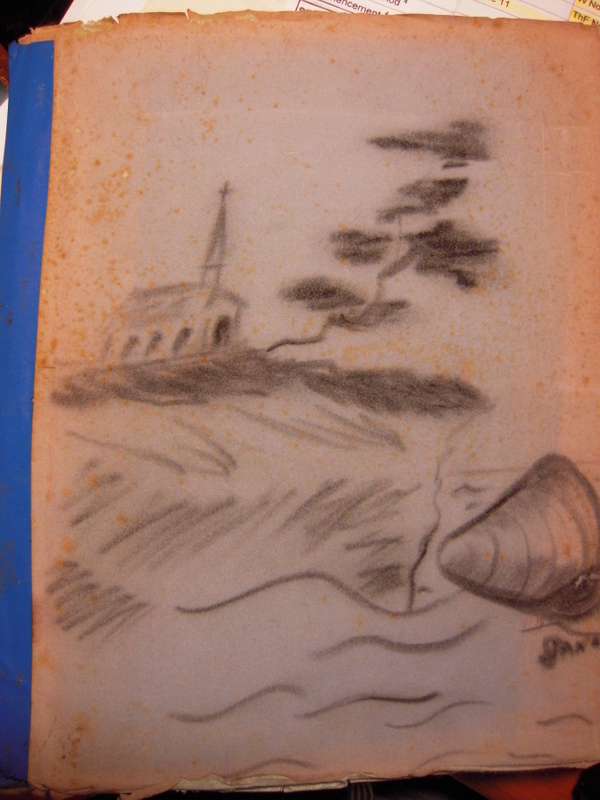 The picture above is the cover of one of their efforts. The cover is spotted with grease and the edges are well worn, as you can see. 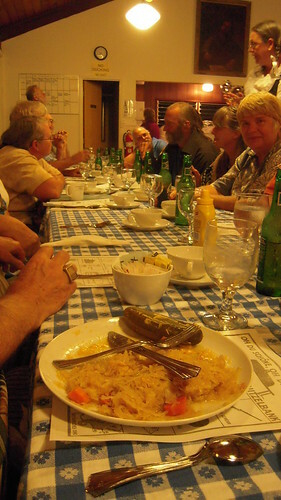 Usually there were no names for the dishes people brought to potluck suppers, so our family started calling them by the name of the person who made it, or sometimes for the town where we ate it. Such is the case for this recipe. I never knew it by any name other than “Altamont Pudding.” When I asked my grandmother where that name originated, she said it was a dish one particular woman always brought to share when my grandfather was a pastor at Altamont, Illinois. It came down through my mother, and on down to me simply as “Altamont Pudding.” I may have even given it to my oldest daughter when she got married. I’m using my mother’s words with almost no editing. Just before she wrote out the recipe, she had been talking about a meal of clam fritters with a cucumber salad. Makes a gooey good hot dessert with this meal (see note above), or it’s a happy thought to take to a sick neighbor, or to serve at church dinners, made in larger quantities. Part I. Melt in a big square pan 2 tablespoons butter, 1 c. brown sugar, 3 c. boiling water, 1 teaspoon vanilla. Part II. Make a batter of ½ c. white sugar, 1 teaspoon allspice, ½ c. milk, 1 c. flour, 3 level teaspoons double acting baking powder and ½ c raisins. Pour the batter of Part II into the Part I and bake 350 degrees for about 35-40 minutes or until done, or until batter rises to top and cooks through. 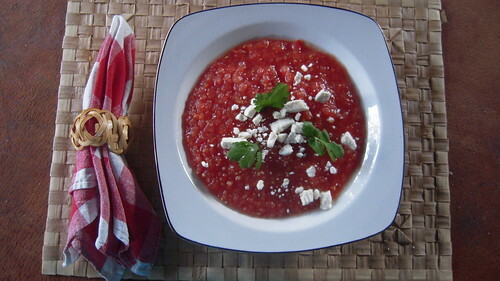 When served, spoon it upside down into sauce dishes; it has its own “dip” on the bottom. Make a double recipe to keep for in-between meal eating. Jane’s old standby for instant company. 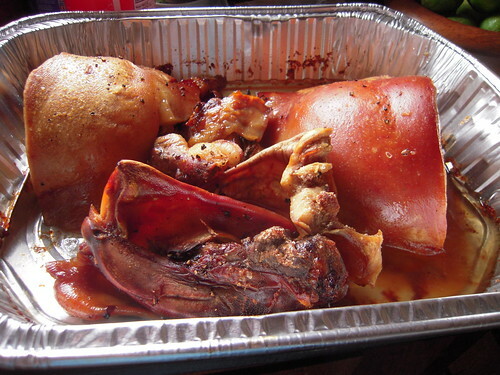 In my freezer, the head of the pig I got from Masazo’s Piggery in Na`alehu remained, mostly because I wasn’t sure how to prepare it. 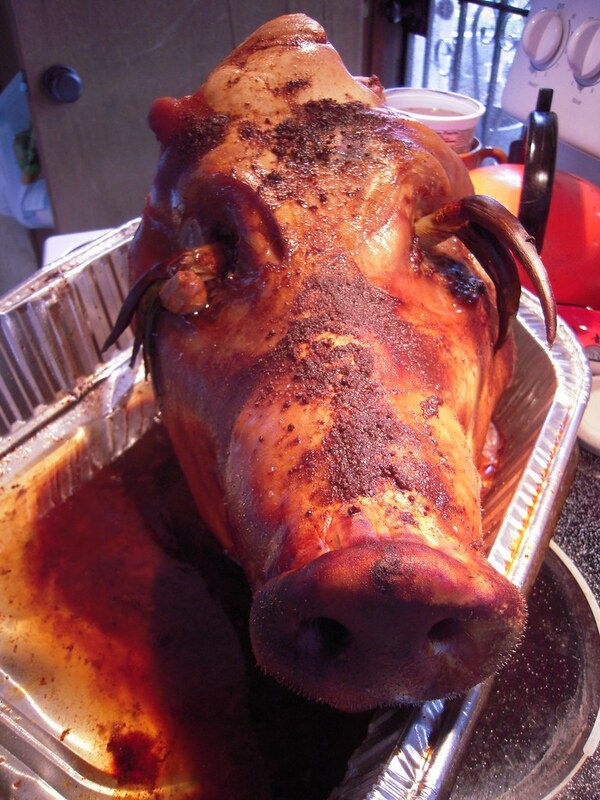 Every recipe I found online talked about half a head of a smallish pig. This was a whole head from a 400 pound pig, probably weighing between 16 and 20 pounds. The eyeballs, ears and snout were a bit intimidating! Fortunately, I had the help of a physician who (sort of) knew what we were seeing. We didn’t cook up the head as a whole, but cut off jowls, tongue, and ears to roast separately from the rest of the head. Please understand that neither of us knew what in the world we were doing, so we took bits from various online recipes. 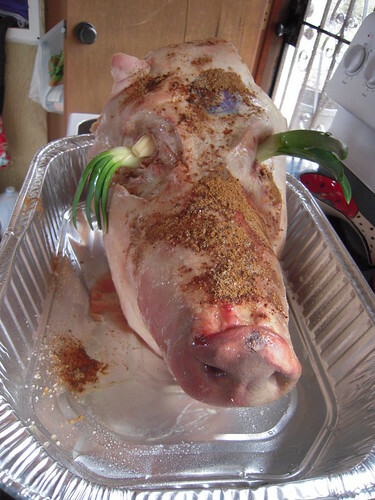 We sprayed the head with canola spray, then rubbed in a mixture of 5-spice powder and ground up sea salt. Garlic cloves were tucked into all cavities, and a cut onion stuffed in the mouth. We started off with 1 ½ hours in a 375 degree F., oven, basting periodically with a honey-water mix. Then we turned the oven down to 325 degrees F. for another 3 ½ hours. I won’t gross you out with some of the other pictures I took during this process, but the end result wasn’t really too bad. 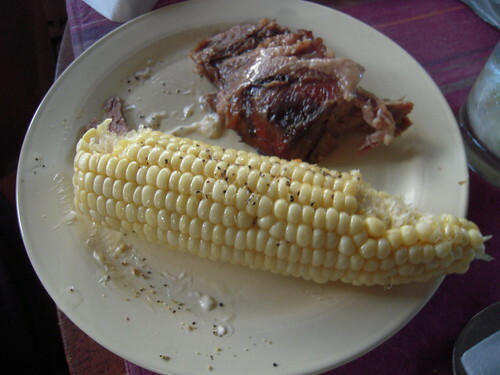 We sliced meat off the cheeks and served with fresh local corn on the cob. The meat was super rich, and I thought it a bit chewy. 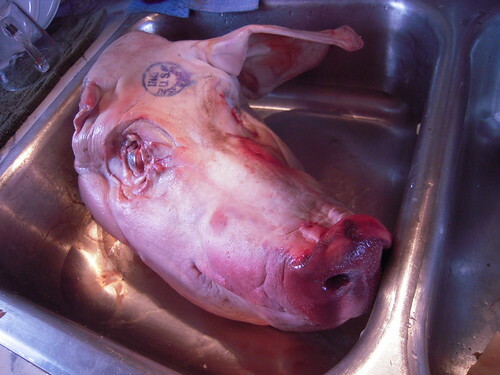 I froze some of the other meaty sections to make Pozole later, a Mexican pork and hominy stew that is traditionally made with meat from a pig’s head and served at Christmas time. The whole ordeal was quite an experience, although I’m glad there was only one head on the pig. I’m not sure I would want to bother with another one! When I was in high school, my father was the first English speaking pastor of a church that had once been considered a “German church.” Everyone spoke German, I learned Christmas carols in German, and the food was always German. No wonder I had trouble in gaining weight! Every Thursday, the women met to quilt and served sauerkraut, spare ribs, and mashed potatoes. They always saved a plateful for me to eat as soon as I got back from school. Then I would sit down and quilt with them, trying to imitate their tiny stitches. 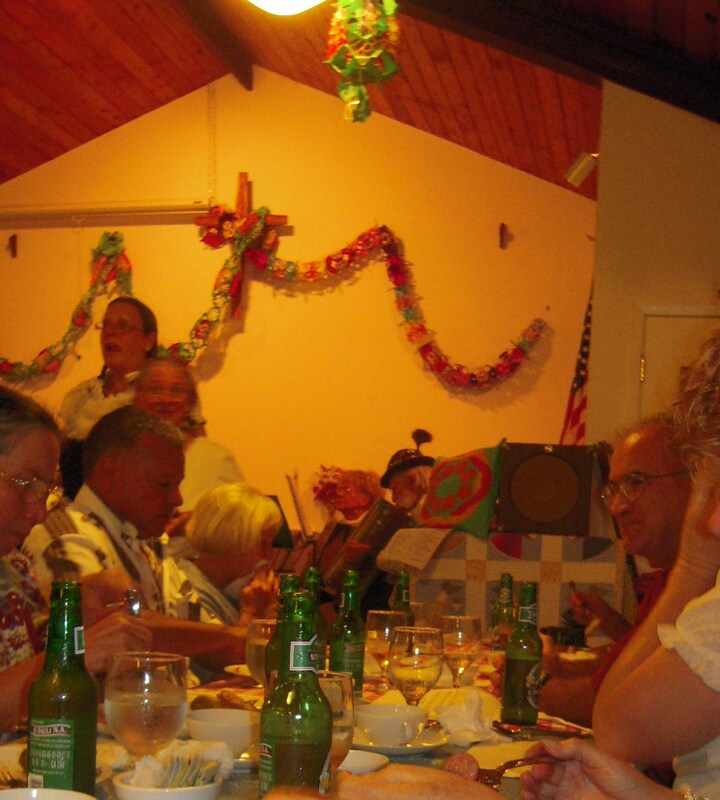 On October 1 of this year, I had the pleasure of attending an Oktoberfest at St. Jude’s Episcopal Church here on the Big Island. 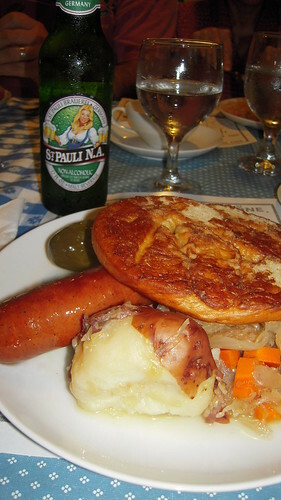 Instead of spare ribs, we were served a long Bratwurst; instead of mashed potatoes, we received a big boiled potato, but we did receive a big helping of sauerkraut and a bottle of non-alcoholic beer (St. Pauli N.A.). Apple strudel finished off the meal. There was a wonderful 7-piece polka band, complete with several accordions, a string bass, trombone, clarinet, piano and drum. 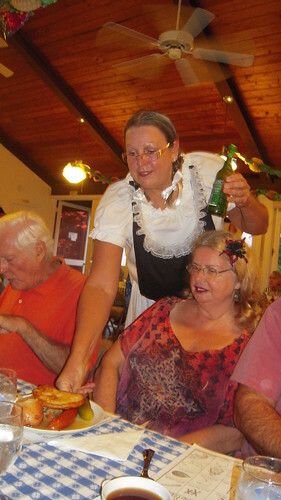 The Fraulein servers were authentic. . . .
. . . and the dancing was exuberant. 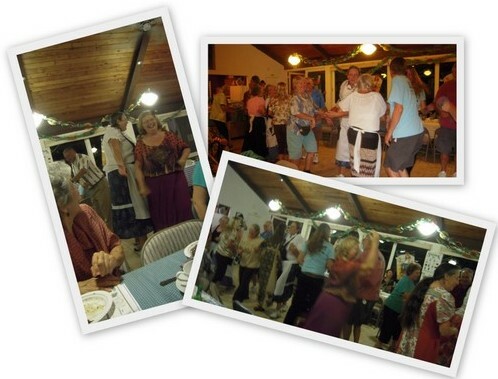 You never forget how to dance a polka! But when I asked a friend to dance with me, she said she didn’t know how. I easily taught her, however, and we took off in a whirl. 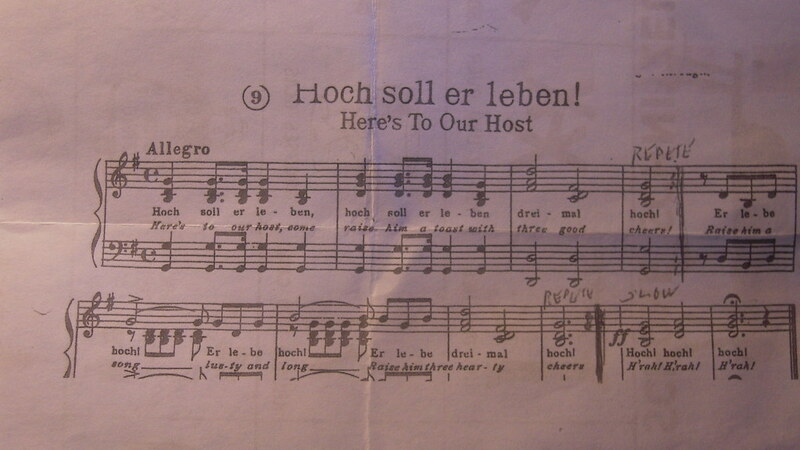 We were taught several German songs. 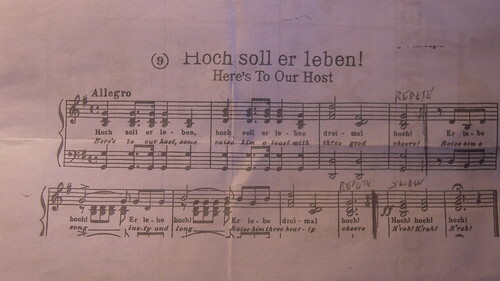 One was “Hock Soll er Leben,” or “Hail to the Host,” which we sang several times during the evening, each time raising our beer bottles to the host. 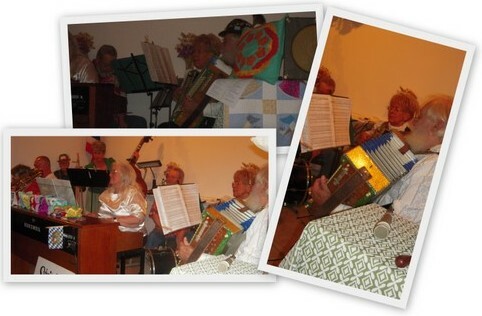 This Musik Meister led us in song, and also played one of the accordions. 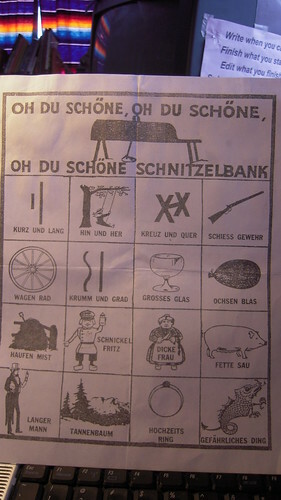 Another tongue-twister song was “Oh Du Schöne Schnitzelbank,” a song we were told was never sung in Germany, but was local only in America. I brought home a plate of leftovers from the church kitchen and relished the meal again later. 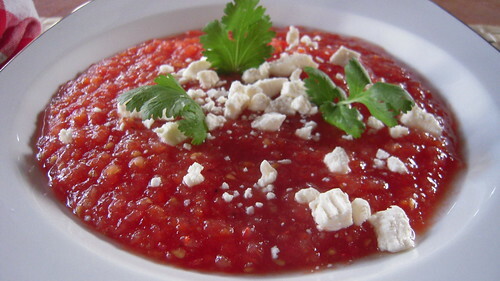 I learned about Gazpacho when I first moved to California in 1960. It was a huge fad at that time, and I was knocked over by it! It’s been called everything, including “liquid salad,” but whatever you call it, it’s simply delicious! This may seem like a summer-only dish to many of the mainlanders, but in California, and especially here in Hawai`i, we can eat it year-round. Zap it up in a blender or food processor until thick and chunky. Store it in the fridge until it’s good and cold. Ladle it into a bowl, top with crumbled feta and sprigs of cilantro. To go with this, I like to serve a good loaf of crunchy rustic bread fresh from the oven, and maybe a big hunk of sharp cheese.